9 Square is located in Huaqiang North Business Circle, Futian District, Shenzhen. It is a shopping center integrating shopping, dining, leisure and culture. Shenzhen “Food and Beverage Emission Control regulations” clearly regulated that the food and beverage store which have certain smoke emission levels have to install the fume purifier. Therefore, the food and beverage stores in the 9 Square have to install the fume purification equipment as required. 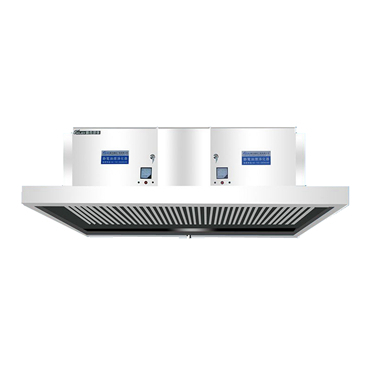 In order to provide a high-quality food, shopping, entertainment environment for the majority of consumers, Its Center has to access to a unified ventilation system for all catering businesses. 9 Square adopted Shenzhen's top-level fume purifier developers. —Guang Jie Environmental Protection Engineering Co.,Ltd. designed a fully functional fume purification and ventilation system for it. In 9 Square Shopping Center, GJESP-12000, a 1.2 million airflow electrostatic fume purifier device , and GJEUV-3200, a UV light deodorizing equipment for 320,000 air volume were used. The fumes generated by all the catering kitchens in the shopping mall are transmitted to the top of the building by means of ventilation ducts, and the fume purification system is used to purify it. GJESP-12000 and GJEUV-3200 are Gojek’s self-developed fume equipments, which combines Germany's advanced fifth-generation fume treatment technology, the core components is imported from the United States. After 8 years of continuous optimization and practical application, its fume removal rate is as high as 98.4%, which is much higher than the national fume emission standard. Shenzhen Guang Jie Environmental Protection Engineering Co., Ltd. is a professional enterprise engaged in the research, development, production and sales of electrostatic fume purifiers, UV light deodorizing equipment, hood purifying integrated machines and combined fume purifiers. The purification rate of fume purifiers is over 98%. It also has high safety factor performances such as fire prevention, leakage prevention and discharge overload.